What’s it about? : Third entry in Rockstar’s Max Payne franchise finds the titular character nearly a decade after Max Payne 2: The Fall of Max Payne. Max has traded in his police badge for a private security gig in Sao Paulo, protecting the spoiled family of a rich businessman. When a street gang attacks the family and kidnaps his employer’s wife, Max again finds himself embroiled in a conspiracy darker and farther reaching than he could have possibly imagined. Massive slo-mo shootouts ensue, blood is spilled by the bucketful and Max narrates it all in gloriously purple prose. Why’d you put it down in the first place? : Spring of 2012 was a time of monumental change in my life – having recently graduated college and starting my first job as a “professional” journalist (a term I use loosely), I split a lot of time between my new town and my college town, where my then-girlfriend lived. Not long after that she graduated as well, moving to a new, different city to start her own career (in retrospect, I should’ve seen the end of that one coming). Between having all of my possessions packed up between three cities, finding my feet as a journalist and near-constant travel, many of my hobbies fell by the wayside, including gaming. As an enormous fan of the franchise in my high school days, I bought Max Payne 3 on release day, but quickly set it aside for more pressing, real-world concerns; by the time I found quality time with my Xbox again, newer, shinier games had been released, and Max Payne found itself the bottom of the backlog pile. Was it worth coming back to? 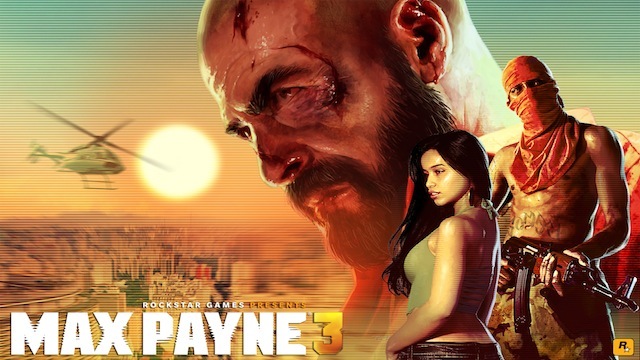 : Max Payne 3 is a third-person shooter that stands beside many of this generation’s best offerings (and considering that this has basically been the “First Person Shooter Generation,” that’s saying something). The spirit of the franchise is alive and well in Max Payne 3 – it’s a hard-boiled neo-noir tale through and through, all grit, violence and over-the-top narration. Gameplay feels classic and contemporary at the same time, with most of the franchise’s most well-known features – notably Bullet Time and fast-paced gunplay – perfectly intermingled with more modern features – like, say, a cover system and AI that’s actually halfway competent. And the game can be a legitimate challenge without feeling cheap; oftentimes finding your way to the end of a stage is a matter of trial-and-error, learning where enemies will pop up so you’re prepared to run through it again when you’re inevitably wasted, making the slow-mo kill-cam on the final enemy of any protracted firefight all the more satisfying. It certainly doesn’t hurt that Payne is gorgeous to look at. Sao Paolo’s lush, diverse environments are a joy to behold, from run-down slums to downtown high rises. The colorful locales don’t detract from the game’s neo-noir cred – the genre is usually associated with darkness and shadow, but Max Payne 3 manages to be just as gritty when set at high noon. This is largely helped by the narrative, which sees Max at the lowest point he’s been in the entire series (which is saying something). Max Payne 3 wraps up the long story of the titular character’s fall and redemption that began in the original title, and there are plenty of twists and turns along the way. It’s a kitschy, just-shy-of-too-much kind of over the top, but it works in a wonderfully B-action flick kind of way. The whole thing is run through a heavy Man on Fire filter, which at its height is a little bit overused, but can be extremely effective when used well. So is Max Payne 3 worth revisiting (or picking up for the first time)? Absolutely; any way you slice it, this is one of 2012’s best games, even if it doesn’t have the freshness of Dishonored or pack the emotional wallop of The Walking Dead. And for around $20, it’s a heck of a way to spend 10 hours.